2 engines with various carriages. Layout fixed to a board 1.6m x 1.22m (5'3" x 4'). Nice layout for adult or child, with low starting price. 1x R083 buffer stop. 8x R609 3rd radius double curve. 8x R607 2nd radius double curve. I’ve photographed a layout which would fit onto a 6 ft x 4 ft board to show the scope and range of pieces included but it could be arranged in many other ways and/or expanded into a larger layout using all the pieces. OO Gauge Model Railway Diorama Layout. This layout is heavy, fixed to a hardwood tabletop which can be detached from the leg base for transport. The layout must be transported level, so an appropriate sized van will be needed when collecting. Most users agree that this software is better than the Hornby software system. Train simulation, which includes picking up and moving trains with the mouse. Easy to create practical layout designs. Drawing lines, arcs and filled shapes (for showing river edges etc.). 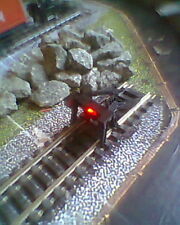 Model Railway layout - OO/HO gauge. R612 is the product code. OO gauge 1/76 scale. OO Gauge for 3 Rail Layouts. Oval Consists of 3 complete ovals in total. over the next coming weeks. and will see what I can do. 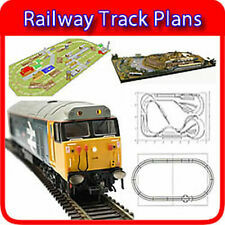 New listingPECO 00 gauge Track/Layout Plastic kit No: ST-297 Platform Ramp unit Stone Type. Width of Platform can be Varied by Selecting Desired Width as Marked on Underside of Platform Sections, and cutting with a sharp Craft Knife. OO, N, TT, HO, S, O, O27, O42, HORNBY Etc. A MASSIVE COLLECTION OF 1000’s OF PRE DESIGNED LAYOUT PLANS. EASY TO USE LAYOUT DESIGN SOFTWARE TO CREATE YOUR OWN UNIQUE TAYLOR MADE DESIGNS. Full colour professionally produced disc graphics. EASY TO USE LAYOUT DESIGN SOFTWARE TO CREATE YOUR OWN UNIQUE TAYLOR MADE DESIGNS. A MASSIVE COLLECTION OF 1000’s OF PRE DESIGNED LAYOUT PLANS. ANY SCALE, ANY GAUGE. Full colour professionally produced disc graphics. OO, N, TT, HO, S, O, O27, O42, HORNBY Etc. EASY TO USE LAYOUT DESIGN SOFTWARE TO CREATE YOUR OWN UNIQUE TAYLOR MADE DESIGNS. A MASSIVE COLLECTION OF 1000’s OF PRE DESIGNED LAYOUT PLANS. Full colour professionally produced disc graphics.